Shrove Tuesday is here next week (27th February), the day when traditionally pancakes are made and tossed all over the place and often end up stuck to the ceiling! So as promised, this week's recipe will give you plenty of time for practicing for the BIG day. This is the recipe I use for crêpes, which are paper thin pancakes found in France (and now all over the world) where they are made on a special griddle. However they can be made just as successfully as thicker pancakes in a cast iron omelet pan or non stick frying pan. I fondly remember having these at a friend's farmhouse in France where they were served rolled with a stick of freshly churned butter made from the farm's cream . . . cholesterol overkill! You might want to try yours rolled and lightly dusted with icing sugar, honey or spread with some of last weeks recipe for fresh raspberry jam? In Germany they are called pfankuchen (literally 'pan-cakes'), in Frankfurt we used to half fill the pan and cook them very thick in the oven, dust them heavily with icing sugar and caramelise it under the salamander (grill) and serve with some lemon juice, honey and jam separately. 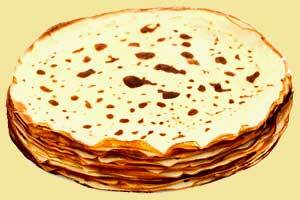 If you have never tried pancake making or never been involved in the tradition of making them on Shrove Tuesday . . . get into it, get the kids involved with making these, they will love it . . . it's a lot of fun.